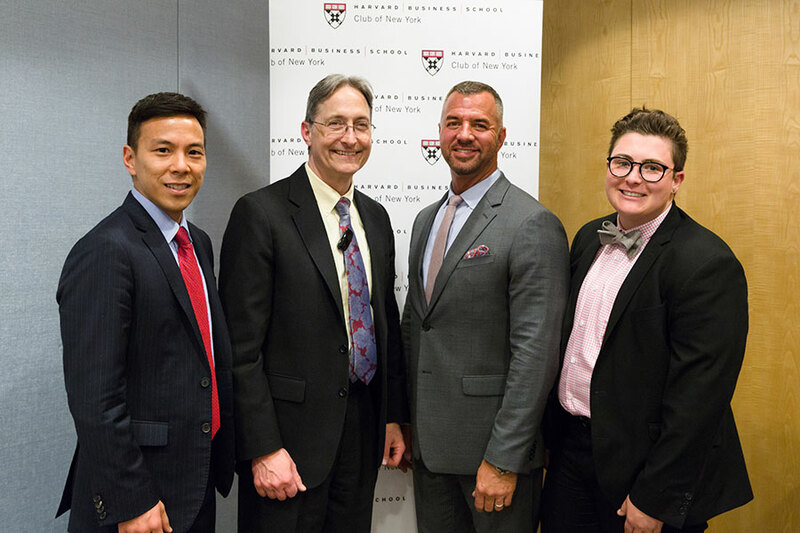 From left, Kelsey Louie, Chief Executive Officer, Gay Men’s Health Crisis, Inc. (GMHC); Professor Herman B. “Dutch” Leonard, HBS; Mike Rogers, Senior Vice President of Development, GMHC; Cameron Gaynor, Development & Events Manager, GMHC. NEW YORK, April 11, 2019 — American business leaders have long been revered for their revolutionary thinking and ability to drive change. Harvard Business School Club of New York is making the case that recognition for an unsung class of leaders in nonprofit management is overdue. The Club’s Community Partners Leadership Award (CPLA) was established in 2015 to spotlight NYC nonprofit leaders who have excelled in tackling longstanding problems and propelling social advancement. This year, 62 organizations applied. Kelsey Louie, CEO of Gay Men’s Health Crisis, Inc. (GMHC), received the top honor of Gold and a $25,000 donation to support GMHC’s mission. Dan Cohen, Founder and CEO of Music & Memory received the Silver award and a $10,000donation, and Jess Dannhauser, President and CEO of Graham Windham, was awarded Bronze and a $5,000 donation. The ceremony featured the case study, “Leadership Lessons from Hamilton: An American Musical,” presented by HBS professor and co-chair of HBS Social Enterprise Initiative, Herman B. “Dutch” Leonard. “Hamilton is filled with lessons on how to lead. Should we follow Hamilton himself and take opportunities as they present themselves? Should we follow Burr and ‘wait for it?’ What about Eliza’s ‘wouldn’t it be enough?’ Leonard remarked. The award committee was led by Leo Corbett (MBA 1975) and William Meurer (MBA 1990). CPLA supports the Club’s Community Partners program, which provides nonprofit organizations pro bono consulting services from teams of Harvard Business School alumni volunteers. The program stems from HBS’s Alumni for Impact program, which unites alumni to work on solutions for the world’s most complex social issues. Past winners include New York Sun Works, MESA Charter High School, Girls Write Now, LaGuardia Community College, Per Scholas, Bronx River Alliance, the Tenement Museum, and the New York City Anti-Violence Project. To be eligible for CPLA, nonprofits must have completed a project with Community Partners or have an HBS alum on their board. To learn more visit https://www.hbscnycommunitypartners.org/.